I'm a real sucker for 8-bit nintendo / cheap tune soundz and if you mix this with some proper glitch, nothing can beat the final effect. This is exactly the case with the new track by John Kay a.k.a. Plus 2, a producer and a fellow glitchhopforum dweller, hailing from Victoria, Canada. 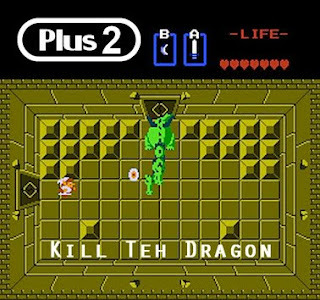 His Kill the Dragon is aparently loosely based on the cult game Legend of Zelda, at least in terms of artwork and 8-bit samples used :) Probably, as I've never had a chance to play it. Montezuma's Revenge - this was the game I remember best from early 8-bit comptuers time, when I played it to death on my Atari - first PC I owned as a kid. Anyway, listen and download this track, while a f...g soundcloud limit of 100 downloads lasts. A very refreshing and original tune for the glitch hop genre. I wish I heard more of such daring attempts at introducing less whompy sound to this scene. Great job!